So far I’ve tackled the stops on the journey by calling in after work, which perhaps as Judy might have told Mr Punch, is not necessarily the “way to do it”. Deciding that a change to this routine was required I thought that to mess things up I would venture into the big smoke after a day “working from home” – just to give the visit a new frisson of adventure…………..well ok, it’s still not hiking across the Andies, but at least I’m trying! 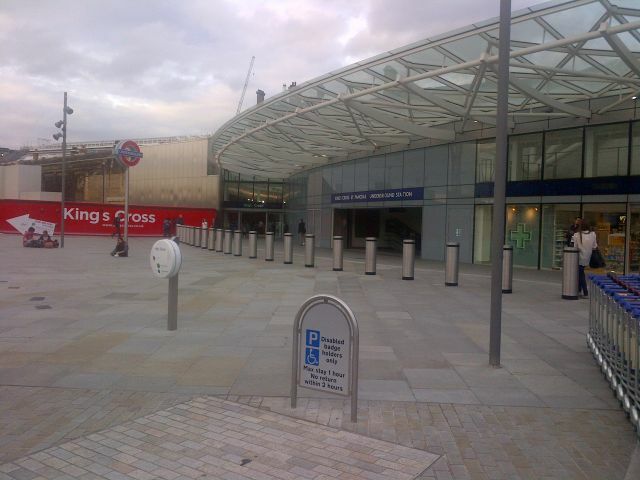 I’d been looking forward to completing Kings Cross as it’s very accessible, was somewhere I knew I could easily get to, and I knew that there were several good pubs along the Euston Road. Also eminent Beer Writer Roger Protz had just wrote an interesting piece for his own website which only served to whet the appetite even more. 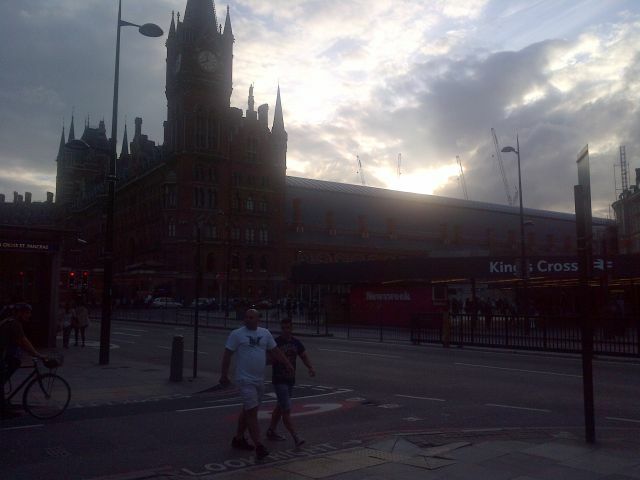 I was in a really good mood arriving back into London in the early evening, firstly because it was a very rare pleasant summer evening, something that’s been in incredible short supply this year but also because I managed to snaffle a leberwurst and gherkin sandwich with me for the train. Til my dying day I’ll claim that one of the best beers I ever drank was a can of Co-Op Pale Ale which I’d “stolen” from a party and secretly drank in bed. I was about 14 and the illicit nature of the consumption made the flavour that much more enjoyable. It must have been a similar effect that made the sandwich so tasty, that and the fact at that time of night you’re guaranteed a double seat to yourself and complete control of the arm rest! 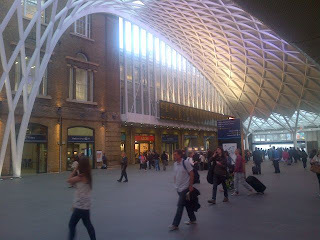 The last time I’d had to go to Kings Cross for any length of time was well over 10 years ago and to be honest the ½ hour or so I had to wait there for someone was pretty grim. The place was a veritable dump, dark, dank and grey and full of dodgy characters, some of whom kept asking me for “business”? Now though, the place is a gleaming, futuristic terminal looking more like an airport than a regional train station. This can't be London. Where's all the litter? The other good thing about going to Kings Cross is that you can also see neighbouring St Pancras from the outside. Honestly, the building is amazing and almost worth visiting this non-touristy area of London for that alone. It’s a real shame that probably 99% of people who go there are only there to catch the Eurostar and I would seriously suggest to any passengers that they try to take 5 minutes to view the place – I’m still wondering what they keep in the turrets. I was trying to get the dramatic skyline over St Pancras - Honest! 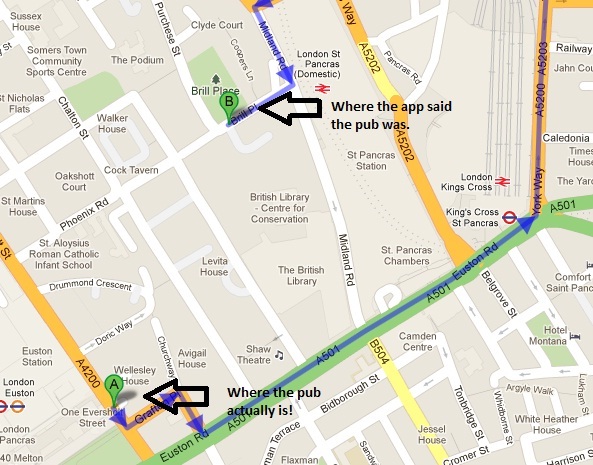 Anyway, according to the trusty Cask Marque app the nearest pubs to Kings Cross would be along the Euston Road, but thinking ahead I might need them for a later visit (check the board, check the board) I instead headed to Grey’s Inn Road and the Lucas Arms, a corner pub from the Greene King stable. 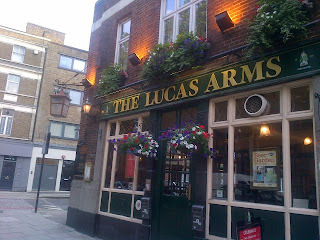 The place has a very nice cosy back-street boozer feel to it, especially as the hustle and bustle of Kings Cross and Euston Road are just around the corner. 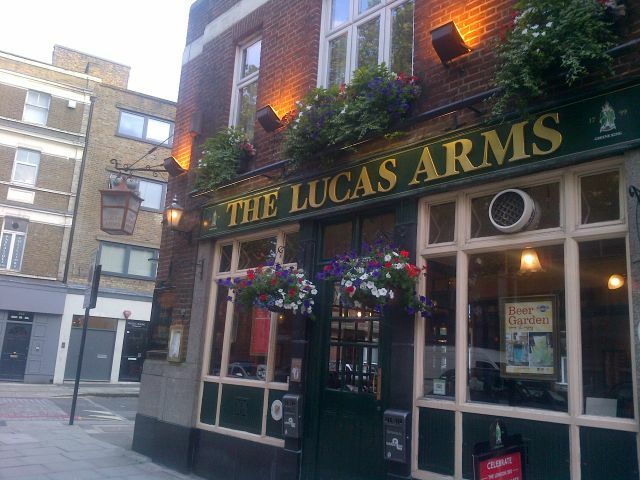 The Lucas Arms - Note lovely old style lamp on the corner. 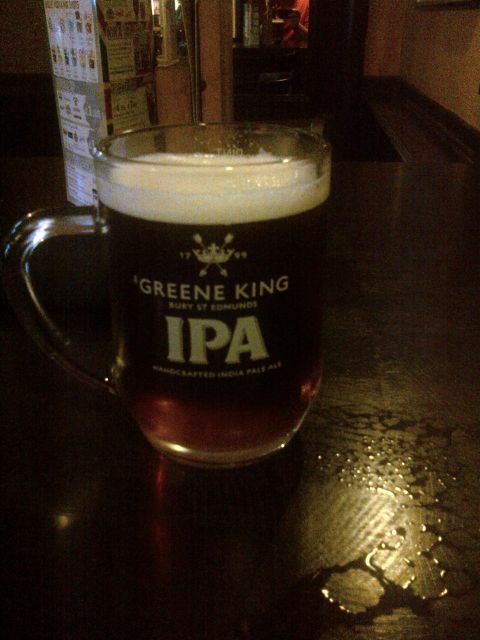 The ales on offer were disappointing common and disappointing few, only GK’s IPA and former Moreland’s Old Speckled Hen but the good news was the IPA was served in a very nice handled mug which I’d never seen before. I’m not a huge fan of mugs to drink beer out of (tea is fine, but not beer) but I do have to say that this version had quite a nice feel to it. 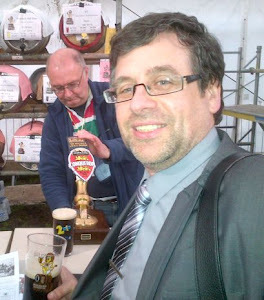 The beer was actually very good as well (if a little chilly). GK’s IPA usually comes in for some stick from the so called beer experts as it’s not (apparently) a true representation of the IPA style, but when served well it can be a very pleasant pint. This one was full of grassy freshness and there is a serious amount of hop punch for a beer that is after all only 3.6% vol. And anyway, as someone reminded me this week, “When will people learn that there's no such thing as good music or crap music? It's just a matter of whether you like it or don't like it!” – Quite right! I then made my mistake of the evening by trying to quickly fit in another pub before catching my train home. 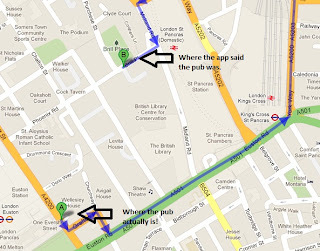 The Cask Marque app suggested that the Doric Arch (Head of Steam) pub was just behind St Pancras when if fact it’s much further up Euston Road, nearer to Euston Station. So after 10 minutes of wandering around Brill Place (which wasn’t that Brill – Geddit! See what I did there!) I gave up and returned home. There's an app for that........but not for this! So only one more scan for the Cask Finder but at least my evening didn’t end as badly as the guy trying desperately to get off the train at Reading, only to find the door was now locked. “Sorry mate, you’re too late” shrugged First Great Western’s sympathetic platform staff as they watched him vainly try to escape. They must put them on special training courses for this level of service! 1. The excellent Alastair at @caskmarque has updated the co-ordinates for The Doric Arch and it now points to the right place! 2. Fellow beer blogger, @timofnewbury tweeted today about a BBC2 program which discussed the architecture of St Pancras station.